Rafa Miqueleto is a graphic designer and illustrator from Sao Paulo, Brazil. 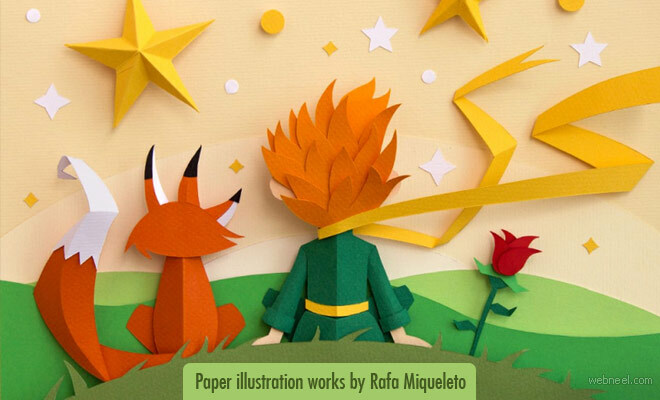 With his inspiration from the movie 'little princes', Rafa did his graphic design project Le Petit Prince. The right combination of geometric forms and typography along with the different colour papers and weights enhances the tactile effect. These designs require manual technics which often demand higher degree of exploring and developing the projects. The graphic design projects designed in photoshop often seem to look artificial as computer generated but the artworks of Rafa undoubtedly pays tribute to graphic designs in a different era of technologies. The curves and cuts shown in sharp way in every design stands unique in details and dimensions.